One week felt like a month in experiences. 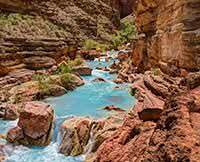 I first took this Grand Canyon rafting trip 26 years ago; but my husband had never been. This trip was even better, way better. We slept under the stars and watched the Milky Way and shooting stars. We had fabulous meals that were nutritious and delicious. We watched the stone and geologic history drift by each day, while our guides reminded us of the Grand Canyon's history and what we were seeing, along with the stories of those who are part of the Grand Canyon's history. Every day provided an opportunity to do side trips, hikes and visits to waterfalls, canyons and pools. We were entertained with poems, music performances, "inspirational stories" and jokes. And, no matter what we did, from hiking to riding the rapids, we always felt safe in the hands of our ever-watchful and professional guides. Traveling with 2 rafts gave us the opportunity to meet and know 4 guides - all professional, yet fun. Justin, Keifer, Alex and Tori made this trip the incredible experience that it was. Flying in and out on a small plane, leaving the canyon on a helicopter and stopping at the Bar 10 Ranch for a shower and lunch added to the awesome experience of our 7-day trip through the Grand Canyon. The pre-trip information and suggestions were spot on and we were fully prepared for our week. 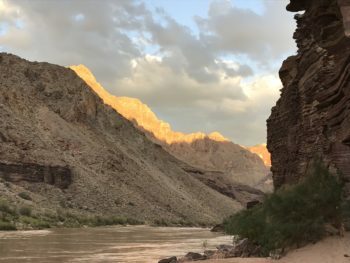 We've been lucky to travel to some amazing places in the world, this Grand Canyon rafting trip was right up there and an experience not to be missed. I was supposed to take my first trip with Georgie Clark, who sold her company to Western River that summer. I am fortunate to have come to know them. They are experienced and by far the best company on the river.